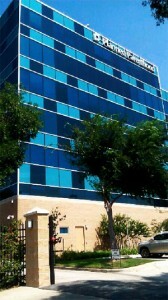 The building, off the Gulf Freeway, opened to patients quietly in 2010. The $26 million project, dubbed Prevention Park, is the largest Planned Parenthood administrative and medical facility in the nation. It also serves as the headquarters for 12 clinics — 10 in Texas and two in Louisiana. And what are they “preventing”? – life. Planned Parenthood was started by Margaret Sanger, and has it’s roots and beginnings in Nazi ideals and doctrines. Sanger was closely tied to Ernst Rudin, who served as Hitler’s director of genetic sterilization. An April 1933 article by Rudin – entitled “Eugenic Sterilization: An Urgent Need” – for Sanger’s monthly magazine, The Birth Control Review, detailed the establishment of the Nazi Society for Racial Hygiene and advocated its replication in the United States. And it was indeed ‘replicated in America’ as Planned Parenthood. Last year, several Texas Democratic women’s group got together and held their annual Christmas party on site at this massive abortion clinic in Houston. Michael Berry, a conservative talk radio host on Houston’s KTRH, said the idea of holding a holiday party at a Planned Parenthood is disgusting and an insult. The Supreme Court upheld the Affordable Care Act (ACA), President Obama’s historic health care reform law. We’ve been anticipating this day for months and we can finally celebrate. The decision means that millions of women, men and families will have access to basic, preventive health care. Tens of thousands of women and men across our service area who lacked health insurance or adequate health care coverage will now have an opportunity to access to affordable, quality health care. source – Planned Parenthood Gulf Coast. The Affordable Care Act by Obama means that YOU, the American citizen, is helping to fund this massive enterprise of around-the-clock death. Remember when President Obama PROMISED that his ObamaCare would not fund abortion with taxpayer monies? Well, he lied…and you are funding his war machine with every paycheck you cash. Do you think that America will somehow escape God’s judgment for this evil? Think again…and get involved! Poured Out For The Nations is actively targeting and praying against this factory of death through prayer and on-site protest. We ask that you would please join with us with your prayers and support to work together to shut this place down for good. We will be reporting on this facility quite a lot in the very near future as we begin to come against them in spiritual warfare. Please join us!